A tall tale about $130 billion worth of gold being stashed aboard a shipwreck off South Korea was likely a cryptocurrency scam, police believe. Shinil Group claimed in July it had found the long-lost Russian Empire cruiser Dmitri Donskoi and it was laden with gold bullion ready for the taking. The company convinced 120,000 Korean investors to buy $53 million worth of a cryptocurrency called Shinil Gold Coin it set up, with the promise of riches. Investors were supposed to receive dividends worth 10 per cent of the gold's value in the first half of last year for their trouble. Instead, the company disappeared off the face of the Earth, deleting underwater footage of the wreck from YouTube and shutting down the cryptocurrency website. Police opened a fraud investigation two weeks ago and on Thursday spoke with two former Shinil executives and now believe it to be 'a scam by a fraudster family,' according to Yonhap. [post_ads]Chief executive Choi Yong-seok stood down when the investigation started and police are looking into his dealing with his siblings Rhu Seung-jin and Rhu Sang-mi. Seung-jin fled to Vietnam in 2014 to escape a separate fraud case. The wreck itself appears to be real as Canadian marine exploration company Nuytco Research said it found the Dmitri Donskoi while under contract from Shinil. 'We were hired to do some very specific things, which is to locate the vessel, positively identify it as the Donskoi, and do a detailed high def video survey of the ship,' its owner Phil Nuytten told Motherboard. However, he had no idea about any vast golden treasure the Korean company subsequently claimed was on board. The Donskoi sank in a 1905 naval battle against Japan off Korea's southern coast and finding it has for years been the holy grail of Korean marine exploration. Financial regulators last month launched an investigation into the firm after news of the discovery caused the stock price of Jeil Steel - a company in which Shinil's founder had acquired a large stake - to jump fivefold. Critics noted that in 2003 another firm had already sparked a stock bubble by announcing the discovery of the Donskoi. Last month, Shinil said it may have gone overboard on the claims and apologised for the 'misunderstanding', saying speculation on the value of treasure contained within the ship was based on news reports and unverified documents. 'We sincerely apologise to the people for this irresponsible citation,' said Choi Yong-seok, the firm's CEO, bowing before TV cameras and photographers at a press conference. Jeil Steel stock had hit 5,400 won (£3.67) but nosedived to around 1,785 won (£1.21) on Thursday, while Shinil replaced its board members and changed its name to Shinil Maritime Technology Co.
At the press conference, the company played a brief clip of underwater footage that appeared to show the ship, with the word 'Donskoi' visible on the hull - but it stopped short of entering the wreck. Observers have also questioned whether the claims were aimed at funnelling investment into a virtual currency which Shinil Group in Singapore had recently started to issue. Choi insisted Shinil Group in Singapore had nothing to do with Shinil Group in Korea, although the two companies' founders are siblings and Shinil Group in Singapore has been selling virtual coins, reportedly with a promise of handsome returns in case treasure is salvaged from the ship. He also said Jeil Steel is not associated with Shinil although Shinil's founder had acquired the stake in Jeil Steel before the discovery of the sunken ship. Experts have said imperial Russia would have no reason to load vast treasure on a ship that was going into battle and have also noted that there was a safer land route to Vladivostok, the treasure's supposed final destination. A Russian campaign group had previously demanded that the entire fortune be returned to Moscow as a 'goodwill gesture'. Yaroslav Livanskiy, an official of the Russian Public Movement to Commemorate Those Who Died Defending the Motherland, led the calls. Livanskiy, who is also head of a salvage group in eastern Russia, said: 'The cruiser is a priceless find for Russia, an invaluable relic, a symbol of our heroic and tragic past, a part of military history of Russia. The armour on the side of the hull is well-preserved while the cannons, machine guns, anchor and steering wheel are all still in place. A large number of iron boxes were also discovered in the ship's hold, which were assumed to contain gold. The firm originally pledged to donate 10 per cent of their find to help develop Ulleungdo, which is a largely uninhabited island but an important tourist destination for South Korea. Development plans would have included a museum dedicated to the ship, according to The Telegraph. 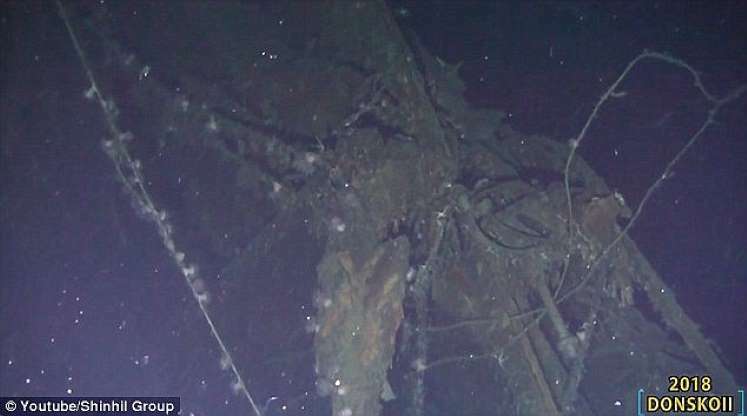 Divers from Shinil had been searching for the wreck for years and finally located it on July 14 at a depth of 1,400ft around a mile off the coast of Ulleungdo. The Donskoi was launched in 1883 and spent most of its life operating in the Mediterranean before being deployed to Russia's Second Pacific Squadron in 1904 after much of Russia's Far Eastern forces were destroyed by Japan. The warship was guarding transport vessels at the rear of the convoy when it was intercepted by a much larger Japanese fleet in May 1905. What followed became known as the Battle of Tsushima and was disastrous for Russia, with 21 of its 38 ships sunk and 4,500 killed - compared to just three Japanese ships lost and 117 dead. The Donskoi escaped the battle itself, though was badly damaged and began steaming for the Russian port of Vladivostok. Before it could get there it was intercepted by the Japanese, who opened fire. At least 60 of the crew were killed and 120 more wounded, including Captain Ivan Lebedev, who ordered the ship to anchor off Ulleungdo and took his men ashore. The following day the ship was scuttled to stop it falling into Japanese hands and the crew surrendered. Captain Lebedev later died of his wounds. The Donskoi was believed to have been carrying gold supplies for the entire flotilla, which would have been used to pay port fees and the salaries of crew and captains while at sea. It is was thought possible that smaller gold stores kept on board other vessels in the flotilla were transferred to the Donskoi as they went down. Given a history of false claims about discovering the Donskoi in the past, Shinil Group promised to bring some of Lebedev's personal effects to the surface as further proof of their discovery.